At 10 a.m. Wednesday, U.S. Bureau of Land Management employees in Cheyenne gathered to unseal envelopes containing bids and checks from coal companies hoping to score the rights to dig in the Powder River Basin. But there were no envelopes to open. No companies bid on the coal lease, said BLM spokeswoman Beverly Gorny. “This is the first time it’s happened in Wyoming,” she said. Minutes later, Gillette-based Cloud Peak Energy Inc., which had first asked the federal government to lease the coal tract nearly seven years ago, released a statement saying mining the coal wasn’t economical. The tract is near Cloud Peak’s Cordero Rojo mine. The Maysdorf II North Coal Tract is slightly larger than 2 square miles and contains 148.6 million tons of mineable coal. The tract is also near the Belle Ayr Mine, owned by Alpha Natural Resources of Bristol, Va., which also didn’t bid. Cloud Peak CEO Colin Marshall said in the statement that the company evaluated the coal tract and declined to bid due to current coal market conditions and the uncertain political and regulatory environment for coal and coal-fired electricity. Company executives had previously said they were considering reducing production at Cordero Rojo, south of Gillette. “Due to the configuration of the North tract and surrounding land ownership positions, we believe a significant portion of the BLM’s estimated mineable tons would not be recoverable by us if we were to be the winning bidder in the BLM’s competitive process,” Marshall said in Wednesday’s statement. The energy value of the coal at Cordero Rojo is about 8,400 British thermal units, or Btus, which is lower than that of the coal at Cloud Peak’s other mines, Marshall said. The company had previously said it can make more money selling the higher Btu coals. In July, during a quarterly call with investors, Cloud Peak executives said that they were considering reducing production at the Cordero Rojo mine by 10 million tons a year, beginning in 2015. “We will continue to evaluate any possible future lease sales by the BLM of these tons in the North tract as market conditions improve,” Marshall said in the statement. 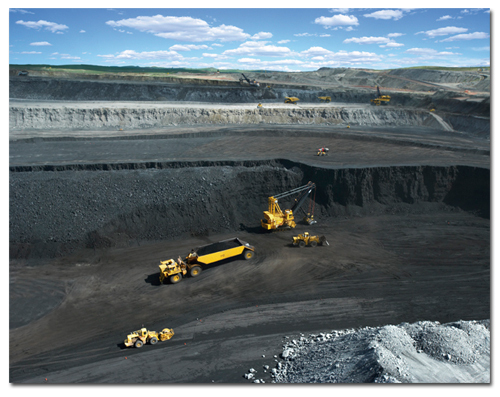 In 2012, the mine produced 39.2 million tons of coal, according to the U.S. Mine Safety and Health Administration. For the mine to continue producing at current levels, Cloud Peak would have to spend a lot of money on equipment and capital costs — including buying a new shovel fleet in 2014 to achieve 2015 production demands, executives said in July. Current coal prices have been sluggish in part because natural gas prices are low and utilities are choosing to generate power using natural gas. Gorny of the BLM said Cordero Mining LLC, which is now a subsidiary of Cloud Peak, nominated the tract Aug. 31, 2006. The proposed coal tract was originally 4,654 acres and contained 434 million tons of mineable coal. BLM employees split the tract into two, which is common “to make sure that what they apply for doesn’t bypass any coal” that a nearby mine would want, Gorny said. The BLM likes having more than one company bid on coal tracts so that the public, which owns the federal coal, “gets the best value for the resource,” Gorny said. Although Marshall of Cloud Peak disagreed with the BLM’s assessment of the tons of mineable coal, Gorny said that the BLM decided upon the tract’s boundaries after analysis. The BLM will not have another coal sale on the tract unless a coal mining company asks for one, Gorny said.